Research was a new addition with the Lost Eden Expansion Pack. It can be accessed by the "Character" button on the bottom left hand side of your GUI. By opening the research user interface on your screen you will see that there are currently two main types of research, personal and global. 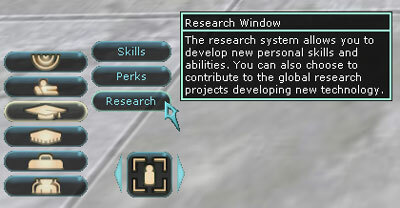 Peronal research affects just your character and global research affects everyone with the Lost Eden Expansion. Let's look at things in more detail! The user interface is split into 3 tabs within the window that pops up. In the image below we have not included the research topics - as stated previously, these are different for each profession. When you have started researching however, you will have a listing of all your started personal research. Again, the research topics have not been included, but it is in this tab that you select which research line you wish to allocate your hard earned research to! You can see which line you are currently researching by where ever the highlighted button is. What we have included in the image though is the Global Research lines. We will go into more detail about these later on. 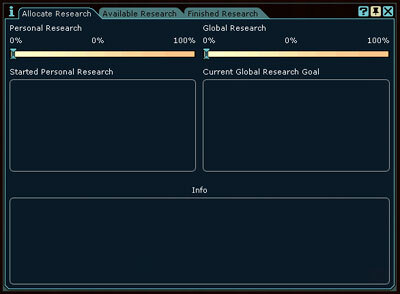 The final tab shows the research you have completed as well as completed global research. Personal research gives you lots of opportunities for increasing your skills as well as allowing you to receive some special abilities that you can use when you are in combat. The personal research available to you is dependant on your profession. To gain research, you will need to start allocating it. You are able to set a slider to state how much of your XP or SK gain you would like to contribute towards your research goals in the Allocate Research tab. 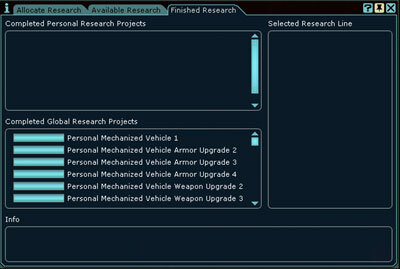 You will then need to choose a research line in teh Available Research Tab. When you complete personal research, new special abilities are made available to you. You can see these listed in the user interface. The skills you gain are automatically added to your character, the actions that you gain will need to be accessed via your perk actions menu. If you wish, you can drag the actions to your hotbar to make them quicker to access just as you would do nano programs, perks or medkits. The actions you can gain have 2 variations, type 1 and type 2. You can differentiate between them easily by their colour - one type is yellow, the other blue. The type of an action is also stated within the description of that action (shift + click). At any one time you can only have one type 1 and one type 2 action running. To use them, click them or press the corresponding number on your hotbar, it will then appear in your NCU. When it is active it provides a chance to proc a special ability when you are in combat. These require that you are being hit by a mob, each time a mob hits you there is a 5% chance the proc will go off and provide you with a buff. For example all the NTs actions fall into this category since they are usually never attacking with any form of weapon. 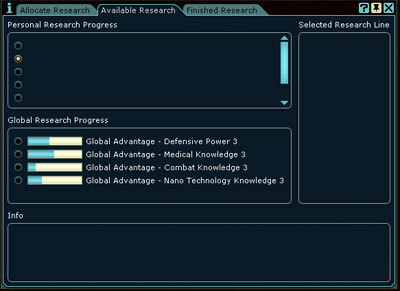 As shown in the images above, you set Global Research in your Available research tab. Global Research require the cooperation of everyone from your side (i.e. Clan, Omni or Neutral). By finishing these Global research lines, vehicles were unlocked for use and some other vehicles gained upgrades - this benefits everyone on the side that completes the research. In addition to vehicles, Global research can be allocated towards knowledge and powers. This then allows for the upgrade of Attunement Devices. Global Research Lines update every 12 hours. When this happens the servers see how much experience has been dedicated to the research and progress the research appropriately. Each side is tracked and updated independently. However, as the Global Research lines are currently complete, there is little point in assigning your experience gained to this.